Comfort, protection, performance – the three core needs covered by every item of fishing clothing that we stock at Angling Direct. Unwilling to offer just anything to, it takes a certain kind of angling gear to make the cut and find its way into our collection. Built with form, function, and value for money in mind, our extensive range of fishing clothes is a cut above the rest. If it’s in the Angling Direct collection, you can rest assured it’s made the grade. The weather in the UK will always find a way to dampen anyone’s day but, with our specially selected collection of clothing, we hope to prevent the weather from interrupting your enjoyment too much. Our range includes hundreds of items covering every need and budget across the board. We have products for fair-weather anglers who only require light protection from the threat of a drizzling day – a range including sun hats, light rain smocks, and pull-on waterproof trousers to fit over your shorts. On the other end of the spectrum, we have a full range of gear for the most hard-core of anglers and for those who are out in all weathers we have a collection of 100% waterproof clothing. 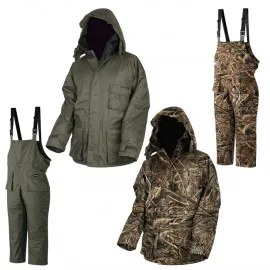 If you like to get right into the water, we also stock a whole array of waders, from mid-thigh waders to heavy duty chest waders, in the footwear section of our site – which is also where you’ll find boots and wellingtons, too. So, whether it is hot outside and you want to keep cool or (as is more likely) it’s cold outside and you want to keep warm, we have the perfect items for you. 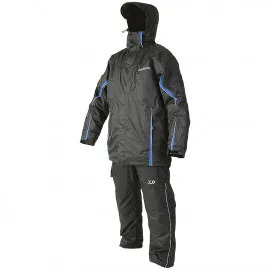 Our range of fishing jackets is comprehensive and they cover all weather conditions. This way, you’ll never be caught out on the bank, beach, or boat by an unexpected change in conditions. We stock a range of jackets. When you’re looking for a winter fishing jacket there are a few key features to watch out for. The first of these is the hydrostatic head rating of the clothing, also called a waterproof rating. This will often be written in millimetres and it refers to the amount of water pressure which can be exerted on the clothing before it begins to leak. Our highest end flotation jackets will offer upwards of a 10,000mm hydrostatic head rating, which equates to a full 10m of water pressure. To be classed as waterproof, fabric has to exceed a 1,000mm hydrostatic head. Most of our waterproofs will fall somewhere between these two figures. Breathability comes hand in hand with waterproof rating, as a jacket that isn’t breathable will leave you sweaty and damp – regardless of whether it is raining outside or not. Whether you’re looking for a lightweight summer jacket or a heavy duty winter option, you’ll want to ensure that your jacket is as breathable as possible in order to keep comfortable on the bank. The second feature to look out for is neoprene cuffs. Not all our waterproof jackets will have these but, if you’re after something more than a simple lightweight jacket and you’re stuck between two jackets, this could be a deciding factor. These cuffs are designed to form a skin tight seal with your wrists, preventing cold air from entering the jacket and eliminating the risk of water run-back inside the sleeves. When the weather is really dire, these cuffs could make a huge difference in your comfort and warmth. The collar of the jacket is another feature to watch out for. Once again, if you’re only interested in a lightweight jacket to pull over your head in a spring or summer shower then this might not be such a concern for you. However, if you’re planning on heading to the bank in potentially miserable conditions then you’ll want to make sure that you’re not only protected from the rain but also the wind. A high collar that reaches your chin is essential for stopping any draughts chilling your delicate neck area. A final thing to look out for is the length of the jacket. Chances are you’ll spend the vast majority of your time on the bank sat down, hunched over a bait bucket, or crouched at the water’s edge with your unhooking mat and scales. This is why it is vital to choose a jacket with an extended back, as nothing is worse than getting a chilling draught right in the small of your back. Three-quarter jackets are also a great option, as these extend down your thighs too to provide increased insulation. Once you’ve got your jacket sorted, you’re going to want to look at investing in a solid pair of angling trousers. We have a huge range to choose from, starting with our casual joggers. These are ideal for use across the seasons and you might be surprised about how many anglers choose joggers as the trouser option for them. Not only are joggers incredibly comfortable but they are also very flexible. Mobility on the bank is always important and you don’t want to feel restricted by your clothing; joggers ensure that this is never a problem and they allow you to move freely on the bank. This also makes them popular as a sleepwear option in the colder months. Most of the joggers we stock will also have large pockets, which are perfect for the storage of your phone, bite alarm receiver, and other items. One thing to note, though, is that not all joggers have zipped pockets, so if you’re stuck between two quality items this could very well be your deciding factor. We also stock a full range of combat/cargo style trousers on our site and in our shops. These trousers are defined by their large quantity of pockets and these are the perfect option for the angler who likes to keep their gear close to hand. Unlike joggers, the pockets on the combat/cargo trousers we stock will almost all offer fastenings – ensuring that your gear is kept perfectly safe, even when you’re leaning over the water when landing a catch. As you might expect, we also stock a full range of waterproof trousers. For the most part, these are designed to be pulled over your existing angling trousers and they’re ideal for storing in your luggage ‘just in case’. 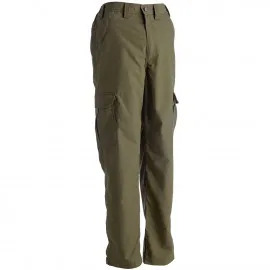 When you’re looking for these kinds of trousers you might want to bear your angling footwear in mind and many of our trousers will have zippered ankle cuffs in order to allow you to pull these trousers on without removing your boots. As with our jackets, you want to ensure that your waterproof trousers offer breathability as well as simply being waterproof. Sometimes, however, trousers simply do not cut the mustard – particularly in the coldest UK conditions. This is when the bib ‘n’ brace comes into play. Also known as salopettes, a bib ‘n’ brace is a pair of trousers that come up to your midriff or chest and are fastened with a pair of braces over your shoulders. These are often (although not always) waterproof and will usually be heavily padded. The biggest benefit of the bib ‘n’ brace is that it comes up over your torso, giving you an additional layer of insulation and protecting you from any draughts which might slip in under the hem of your jacket. This is ideal in the very chilliest months when you’ll be grateful for this extra layer of padding. Bib ‘n’ braces, or angling salopettes, will usually be adjustable in order to ensure that you can get a comfortable fit. This will normally include an elasticated waist section and adjustable shoulder straps, too. Some of our bib ‘n’ braces will pull up completely, whereas others will have a central zip that lets you step into the trousers. If you’re a male angler, then a central zip might also be a preferable option, as it allows you to answer the calls of nature without having to completely undress. Once again, you might want to look for zipped or expanding ankle cuffs, as chances are that you’ll pull your salopettes up over your boots. A final thing to look for across the range of angling clothing, but particularly with our bib ‘n’ braces, is special reinforcements on the key wear areas. These areas include the knees and the bottom – in short, the areas of the body that are most likely to experience friction and stretching. These reinforcements prevent the clothing from prematurely wearing in these areas, increasing the longevity of the item. Our angling clothing sets combine jackets, trousers, and bib ‘n’ braces to create one complete outfit. This is also the place where you’ll find our selection of base-layers; thermal under layers which have been purpose designed to preserve your body heat in the very coldest of conditions. Clothing sets can sometimes be a cheaper way of buying your jacket and trousers, which is ideal for the angler on a budget. If you’re someone who spends as much time on the water as you do off it, then this is also the place to look for your flotation suits. Ideal for use whilst sea fishing, flotation suits feature a number of specialist safety features to ensure that if ever you did end up in the water you wouldn’t be in too much of a pickle. Daiwa, Sundridge, and Imax are all brands which produce top end flotation suits, Preston has a range of clothing sets for the match angler, and both Chub and Nash produce multi-piece suits for the carp angler. It goes without saying that our clothing range contains a huge variety of angling hats. These are suitable for all weather conditions, from woolly beanies and bobble hats to keep your head warm during the winter to classic baseball caps to keep the sun off your face in the more pleasant months. The hats in our range come in a variety of styles, from looks that wouldn’t look out of place in the most fashionable high street shops to classic bank wear that clearly identifies you not only as an angler but also with your favourite angling brand. Snapbacks, trucker caps, and bucket hats all feature in our summer line. Beanies, bobble hats, and arctic hats (with ear flaps) make up our winter range. We even stock hybrids of the two, which offer the warmth of a woolly hat with the shade of a peaked cap. T-shirts are fairly self-explanatory in terms of their use and, whether you’re looking for the item to see you through the summer or you simply want an extra layer to wear in the colder months, we have a huge variety of styles for you to choose from. T-shirts that look as good off the bank as they do on it are proving extremely popular and they all come in a range of angling friendly colours. This includes the Fox Chunk range, as well as a variety of Korda’s angling clothing, and these are both brands that pride themselves on producing stylish and practical clothing for the carp angler. We also stock a huge range of polo shirts, too, for the angler who prefers this look on the bank. The humble hoody is another angling clothing item which is well worn both on and off the bank. Offering a combination of warmth and comfort, it is ideal for wear in those in-between seasons when the weather isn’t warm enough for your t-shirt but nor is it cold enough for all full winter jacket. It can be used as a layering device in the colder months, too add an additional layer of insulation, or as a sleepwear alternative – in case you need to spring to action in the middle of the night. There is a huge range of styles and designs in our store, from all the biggest names, and you’ll find everything from classic grey or black hoodies to fully branded-up designs. As you can see, we stock clothing to suit all anglers through all seasons – no matter your needs, we’ll have the item for you. All fishing clothing across our range has been extensively tested and approved for its quality, performance, and value for money. We only ever list items we’re proud to use personally on our own fishing trips. What’s more, we, like you, want to look good as well as keep dry on the bank, so we do our very best to only bring you products that are stylish as well as practical. You’ll find all the world’s leading angling clothing brands on this page of our site and as the UK’s leading Daiwa stockist we can offer incredible deals on across its range of fishing clothing, too. What’s more, we’re always on the lookout for new innovations and the next big thing in fishing clothing design, so check back regularly to see what we’ve added to our store. So, whether you’re looking to for that bit of clothing that will see you through a cold winter at the water’s edge, or you’re just after a piece that proudly proclaims you’re a supporter of a specific brand, Angling Direct has the clothing for you.